Hanoi (VNA) – The Vietnamese Government will do its utmost in maintaining and bolstering the traditional friendship and cooperation between Vietnam and Cuba. 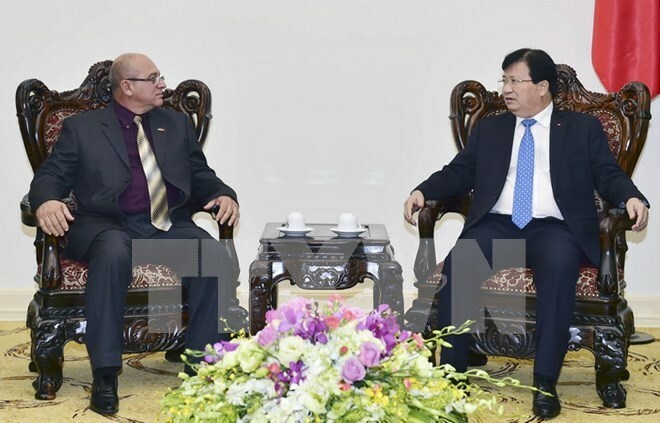 Deputy Prime Minister Trinh Dinh Dung made the remark during a reception for Cuban Minister of Construction Rene Antonio Mesa Villfana in Hanoi on June 14. During the meeting, Dung congratulated the Caribbean country’s recent socio-economic development achievements, despite being affected by an over half a century long embargo. He underlined that Vietnam will instruct relevant ministries and departments to create favorable conditions for Cuban investors to operate and invest in Vietnam, especially in areas of transport and construction and vice versa, in order to effectively deploy agreements on bilateral economic collaboration.